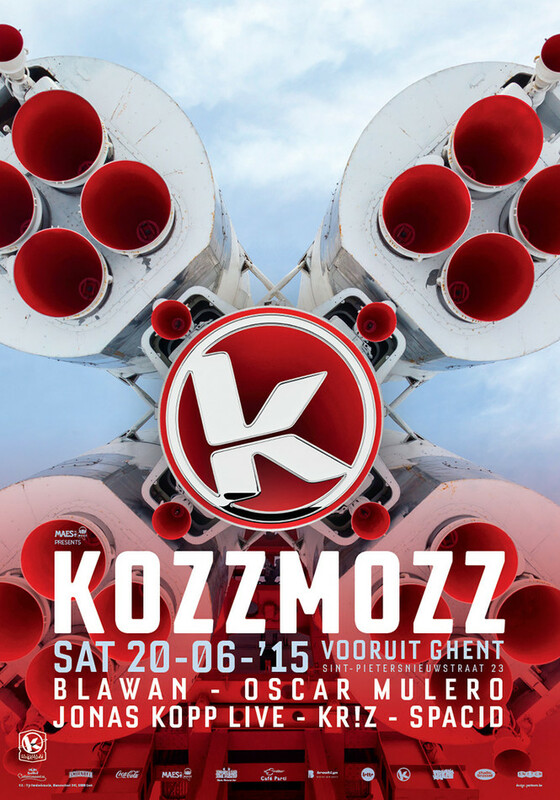 Kozzmozz continues its ’20 Years of Kozzmozz’ deep space research with a new, exciting edition on June 20th. They will guide you through the infinity of the universe. Space is realy big and the distances are immense. The radiation outside a solar system is incredibly dangerous and the closer you get to the speed of light, the more your mass increases. To solve this problem we’re experimenting with a new and faster way to travel between galaxies and solar systems (as there are no speeding tickets in space). Yes dear earthlings, there’s more going on above your heads than you think. To really go boldly where no man has gone before, our scientists are working on a telepathic techno communication device (TTCD) which will allow us to travel faster and further into space than what the regular light speed systems offer us. This device will allow us to travel by using the telepathic code that’s hidden in techno music. The transmitter/receiver technology is as big as an asteroid belt and will send a signal throughout the entire universe. And now comes the interesting part for our beloved inhabitants of the blue planet. In order to test the prototype, we will set up a receiving station at the next Kozzmozz. Sending out the techno signals will be three international heavy-weights and our beloved residents. Over the past few years few producers have caused as much commotion as Blawan. His label associations—Hessle Audio, R&S, Clone Basement Series, Hinge Finger—speaks volumes. But it's his percussion that speaks loudest. Jamie Roberts is a former drummer, and his intricately programmed tunes seem to bear out this history. Quite simply, Roberts hears things a tad differently than the rest of us. It's clearly resonating in many different quarters. Blawan is currently the number one commander of techno redefined in rough shape. His groove is always innovative and demanding, never cold or dull. The last couple of years you can find him week after week in the biggest clubs, parties and festivals around the world. A move to hardware in the studio has led to frequent collaborations with The Analogue Cops and Pariah, the latter of which he performs with as Karenn. This time he will perform solo and his relentless techno-sets are known to drive any crowd of true techno lovers absolutely wild. He will spearhead the line-up of this new Kozzmozz voyage. Oscar Mulero’s DJ career has been as prolific and long lasting as the development of dance music. As a key figure in this evolution, Oscar has always absorbed new trends and kept his finger on the pulse of electronic dance music, from the end of the 80’s right up to the present day. 2000 saw the birth of his own label Warm Up and a couple of years later, its offspring Pole. From then on, all Oscar’s efforts were focused on releasing his own material, whether home or away, on the very best techno labels of the planet, such as Coda, Pure Plastic, Tresor, Sheep, Tsunami and Main Out. Since then, he hasn’t stopped producing, remixing and appearing on electronic stages everywhere. 2011 saw the release of his first LP, “Grey Fades to Green”. A double CD also released as a 4 vinyl set as well as Oscar's second full length album “Black Propaganda”, a twist in his trademark sound on behalf of a modern and dark approach to techno. Warm Up Records celebrated its 10th anniversary in 2012 with thirty four releases to date. The most important musical projects of 2013 were the launch of the remixes of his album Black Propaganda, the project Spherical Coordinates with Christian Wünsch, as well as other releases for labels such as Semantica, Modularz, Blank or Detroit Underground. Last year he struck an alliance with Perc Trax and they created their joint showcases. This year his third album “Muscle & Mind” will be released. He has joined our space-flights several times and blew us away time after time, we are sure, he will do it again. Few would dispute Jonas Kopp as being one of the most prominent and exciting figures to emerge from Argentina in recent years. An accomplished producer, in-demand remixer and versatile performer, he has fast transitioned from Buenos Aires’ best-kept secret to one of contemporary house and techno’s leading lights, on a par with genre-defying luminaries such as Levon Vincent, Ben Klock, Marcel Dettman and Ryan Elliot. Whether it’s deep Chicago-inspired house (Curle), or driving basement-ready techno (Stroboscopic Artefacts, Krill Music, Ostgut Ton), cavernous basslines and mesmerizing rhythms flavor his eclectic discography throughout. Also on his first solo album "Beyond the Hypnosis" which came out on techno mother ship label Tresor last year. His more techno-orientated live PA show has been refined over the years using a blend of digital and analogue equipment, unveiled for the first time at the prestigious Berghain back in July 2010. He has since remained a regular fixture at the Berlin institution and club circuit Europe-wide, totaling memorable appearances at ADE, Sonar and Amsterdam’s Trouw—to name a few. And now he will bring his live-act to Belgium for the first time! Bringing you up to light speed will be resident Spacid who knows how to transmit the perfect techno signal like no other and you will be brought back to orbit by Kr!z who’s an internationally acknowledged techno commander. His Token Records label is revered all over the world and just completed an Aphelion Tour around Europe which came to an end with an enormous line-up of Token artists in Berghain. Kozzmozz will send out a clear techno signal once again so you can join our astronauts in a deep techno hyperspace journey and escape Earth’s gravity. We hope to catch you there. Remember, if you can’t imagine it, you can’t do it!